In 1859, Orange first appears in the Methodist Texas Conference records. Orange was on the Old Spanish Trail and itinerant preachers, known as Circuit Riders, were a big factor in the colonization of the West. Until the late 1850’s no religious denominations were in Orange. These traveling ministers preached here only once every three months. Orange, Jefferson, and Hardin Counties were known as the “Alligator Circuit.” The Reverend Daniel Morse, one of the first of these Circuit Rider ministers, supplemented his income by killing alligators and selling their hides. In 1873 a little group of 44 faithful Methodists joined together to form the first mission church in Orange. They purchased a plot of ground on College Street facing the Evergreen Cemetery and built a tiny wood-frame building. The records stated that “it shall be free to all other evangelical denominations.” Services were held once a month with Rev. Gillum as the first minister. Mrs. Emma George Latchem’s name is listed first on the register. This first little church was used until it was destroyed by fire in 1886. Services were then held at the Court House. In 1889 a dream became reality when land was purchased at the corner of Border and Henderson Streets. In 1890 a new church—a one-story wood structure with a large sanctuary and a room at the rear for the primary department— was erected and occupied in 1892. The beloved Miss Annie Sells served as primary superintendent for many years. On September 1, 1894, 334 members were listed in the first church register with Mr. W. H. Malone as Sunday School Superintendent, a post he held for 37 years. Rev. W. W. Watts served as a longtime pastor here. As the town grew toward the north, a location change was needed. In 1910 the property at the corner of Sixth and Elm Streets was purchased and in 1912 he wooden structure was moved from Border and Henderson Streets to the current location at Sixth and Elm Streets. In 1919 the church engaged an architect, Thomas Avant Howell, a member of the church and the Board of Stewards since 1903, to plan and build the present Gothic Structure. In 1921, while still under construction, this building was occupied. On June 10, 1923, a formal opening was held when it was completed. The money-raising project to pay for the building continued for more than 17 years, from 1919 through 1936. In 1937, the Rev. Ed R. Barcus, Jr., came to Orange as pastor, and he was instrumental in the debt being paid. The formal dedication was held March 29, 1937, during District Conference. Bishop A. Frank Smith presided with representatives from all 31 churches in the District present. In the 1950’s the old parsonage was moved and a much-needed Education Building was erected on the site. This building, furnished by Higman Towing Company, included classrooms, the Henrijo Gale Coale Library, Emma Moss Parlor, and “Tow Inn,” a recreation room for the youth. The original sanctuary building was remodeled to include downstairs a fellowship hall, kitchen, offices, and restrooms. The refurbishing of the sanctuary was in memory of Mrs. Gladys Slade Brown. 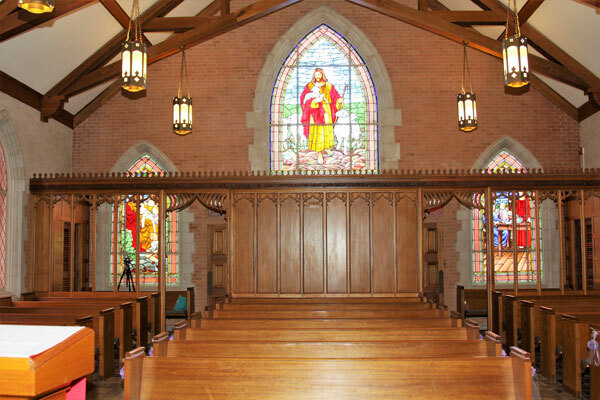 The Slade Memorial Chapel was a gift to the church from Edgar W. and Gladys Slade Brown, Jr., in memory of Mrs. Brown’s mother, the late Mrs. Minnie Robertson Slade. Constructed of Indiana molded limestone, its moldings are in pure gothic design. The narthex screen as well as pews and altar furnishings are all blonde mahogany and have special hand carvings of Christian symbols. The chapel organ was custom built and is a two-manual Moller designed for the chapel by Mrs. Slade’s grandson Slade Brown of Monroe, Louisiana. The organ was a gift from Mrs. Slade’s grandchildren: Mr. and Mrs. Edgar Brown III of Orange; Mr. and Mrs. John S. Brown; Mr. and Mrs. Lutcher Slade Brown; and Mr. and Mrs. Charles Ebert Brown, all of Monroe, Louisiana. The original altar pieces for the chapel, including a baptismal bowl, cross, vases, and candelabrum, were given by Mr. and Mrs. Sidney P. Hanson in memory of their son William Slade Willison, who was killed during World War II. These pieces are on exhibit in the History Center. The brass communion service was a gift of Mrs. Anthony Richard Fox of Center, sister of Mrs. Slade. In the 1950’s under the direction of the Rev. Karl Bayer, the church again renovated the sanctuary. Each project maintained the original design of the building. In 1972 the additional property north of the church was acquired for a parking lot and tennis courts. These improvements were gifts of Mr. Ward Stephenson in memory of his mother, Margaret Kenna Stephenson. 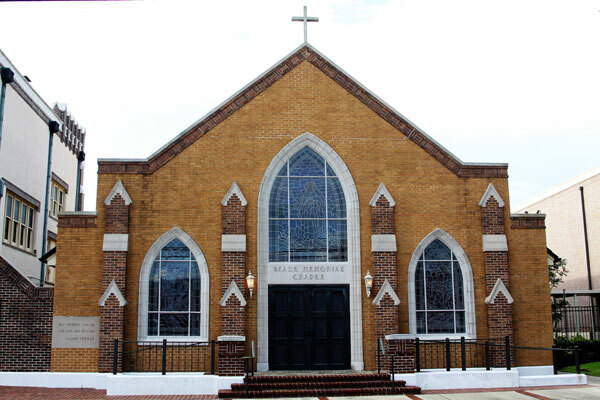 In 1989 the exterior of the church building was restored and a connecting building, including a large elevator, was added. The now enclosed courtyard is a beautiful Prayer Garden. In spring 1998, the Marjorie H. Malloy Spiritual Enrichment Center opened to provide a setting for groups of all ages to grow in Christian commitment through worship, study, rest, and fellowship. The Malloy Center was made possible by the generous contributions of the members and the Malloy Foundation. The Malloy Center can be reserved for several functions. Immediately following Hurricane Rita in September 2005, the Red Cross utilized the Malloy Building to house their volunteers as well as the Texas Guard. For months following this hurricane, the Malloy Center served as a haven for the many volunteer groups who came to Orange to help rebuild the damaged homes and clean up debris. 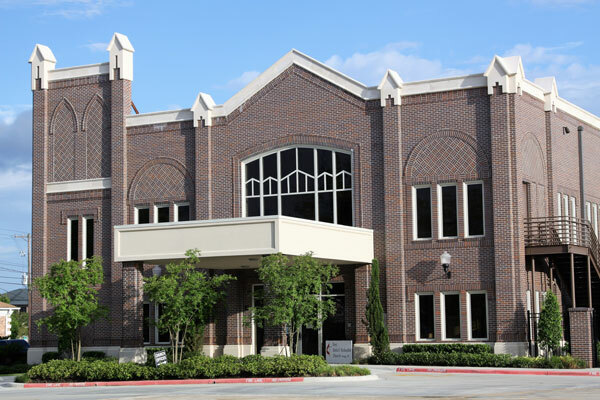 In 2000, the History Center, located in the foyer of the Administrative Center was established with memorial funds donated by the Frank Rach family and the Karen Peery family. Information in the Center traces the history of the church, the people, and ministers who served here. 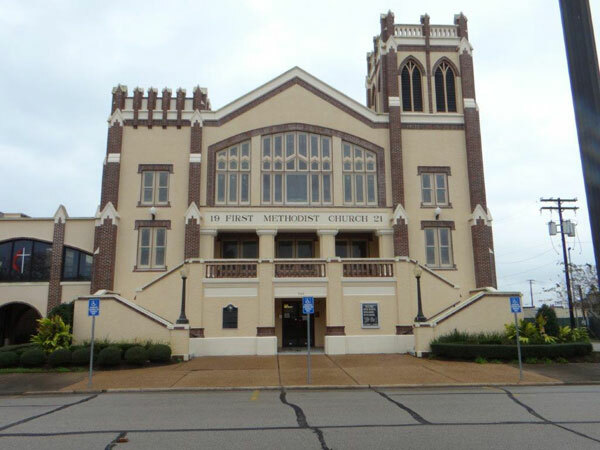 In 2001 the stained-glass windows in the sanctuary were recorded with the writing of The History and Art of the Stained-Glass Windows of First United Methodist Church, Orange, Texas. On January 21, 2007, the church celebrated the ground breaking for the Family Life Center, which provide areas for large dinners, meeting rooms for youth groups, media areas, a fully equipped kitchen, and stage/seating for musical and drama productions. Throughout the years, the church also has provided lovely parsonages for the ministers. The first parsonage was adjacent to the church on Border Street and in 1914 the church acquired a house on Sixth Street. The Cecil R. Coale house at 908 Sixth Street and the Charles E. Cottle house at 1107 Pine served as homes for our associate ministers before the home at 8 Pin Oak was purchased in 1994. In 1951, when the parsonage on Sixth Street was sold, the church acquired the Judge John Thomas Adams home at 1012 Pine as a parsonage. In 1962 Mr. E. W. Brown donated the house at 4 Knotty Pine to be used as a parsonage. In 1999 the current parsonage was built at 4907 Woodway. Our church has been committed through the years to meeting the needs of the congregation and the community in making disciples by sharing God’s love through Christ.